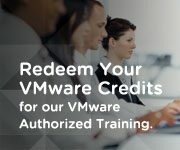 Validate your ability to install, configure, and administer a vSphere data center virtualized with VMware NSX, demonstrating creation and administration of a virtual network including Layer 2 switching and both static and dynamic Layer 3 routing, virtual network devices, and edge services such as DHCP, DNS, and NAT. Path 1: Just starting with VMware Network Virtualization technology. Gain experience with NSX technologies (minimum 6 months recommended). Path 2: Hold a qualifying Cisco Certification. Note: This path is only available until January 31, 2016. Path 1: If you hold a current VCP-NV certification, you will automatically be granted VCP6-NV certification status.